Laurentia Technologies has started a collaboration with the Centre for Molecular Recognition and Technological Development (IDM-UPV) for the industrial scale of strip or smart tags based on colorimetric sensors that indicate the status of food. These devices are integrated into the food’s packaging, being present throughout the distribution cycle, storage and transportation. Thus the safety and quality of products are controlled until they reach the end consumer. 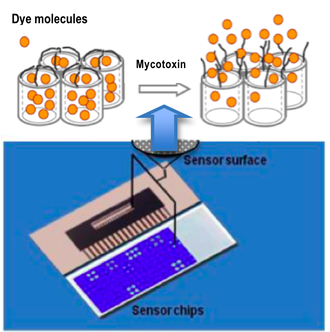 The optical sensor is a nanoscopic matrix where is introduced a dye, which is released (providing a color) in the presence of substances that determine the loss of properties of food. Therefore act with a color change upon detection of certain acids, amines or mycotoxins released by food. Through a visual change, consumers and the food industry can be alerted on the product status establishing a precise lifetime. So the package itself will be the report of pollution or degradation of the product throughout the processing cycle.